This site contains information that we have gathered on Seiple (and other spellings) families. The information on this site focuses on four German immigrants: Johann Conrad Seybel, George Heinrich Seibel, Johann Marx Seipel and Anthony Seyple. This information has been gathered over the years from a variety of sources and is believed to be generally accurate, but may contain errors. 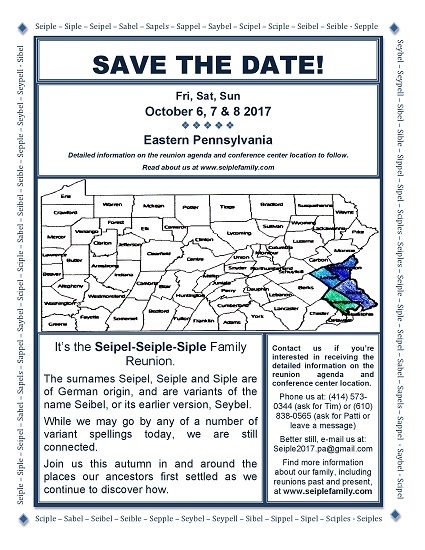 We would love to hear from you if you are related to any of the Seiple families. We may also have information about other Seiple/Seipel/Siple lines that we have not tied into any of these four immigrants. Please use the link at the bottom of the page to contact us. Joe and Helen Gratzinger of Philadelphia found a 1909 Seiple Reunion banner in Joe’s father’s belongings. The banner is made of wool or felt, colored blue and red with white letters and approximately 4 ft. by 2ft. Joe and Helen donated the banner to Roy Siple of Vienna, VA, in September 2012. Roy Siple took this picture.